McGee Storage & Handling looks for unique solutions to safety issues among clients in diverse industries. “Many of our customers only have an idea of the problem; they want us to provide a solution,” said George Griffeth, Sales Executive for McGee. Griffeth and members of the McGee staff pursue the safest and most affordable solution for logistics companies and distribution centers. “We have to provide solutions that evolve with new safety hazards,” said Griffeth. An installation of Rack Safety Straps in one of McGee’s customer’s warehouses. This customer is using the straps to protect the large windows behind the racks from anything falling. For example, one of McGee’s customers had an accident where a driver drove a company truck out the wrong door of the warehouse…the one without a ramp. To avoid future incidents, the company needed a simple visual barrier to guide traffic in and out of the warehouse. 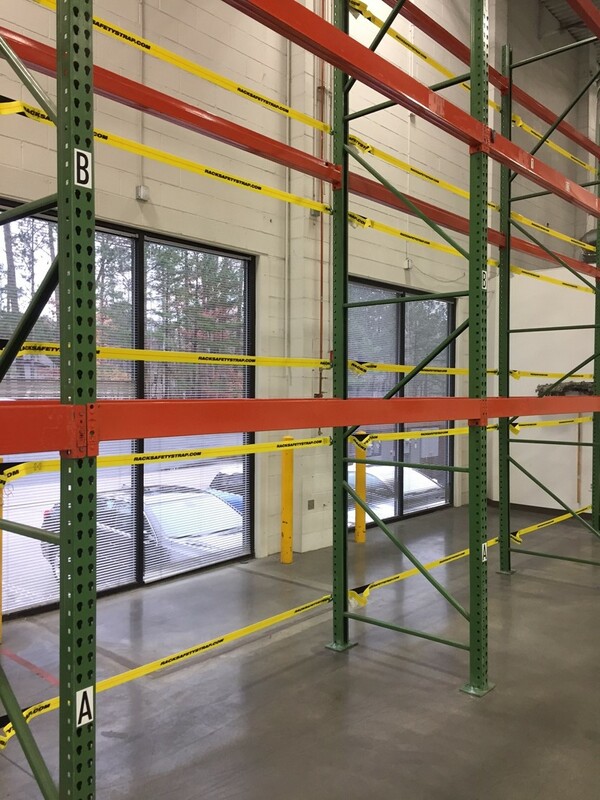 Another McGee customer needed to provide a physical barrier on top of warehouse racks, prohibiting inventory stacked above 12 feet. While this simple requirement from the local fire marshal could be solved with many products, Griffeth and team chose Adrian’s Rack Safety Straps. To stay ahead of these challenges, McGee relies on a broad range of safety solutions, including traditional metal rack guards and newer, innovative products such as Adrian’s Safety Solutions Rack Safety Straps. In contrast to traditional safety solutions, Adrian’s Safety Straps serve as lean, visual barriers to help avoid warehouse accidents. From warehouse logistics markers to rack height restrictions, Adrian’s straps serve as a practical solution to unique warehouse safety issues. “We even use these straps to prevent dock door damage,” added Griffeth. Metal wiring is sometimes several times the cost of Rack Safety Straps, for the same outcome. In addition, the Pallet Rack Safety product line does not need any tools or retrofitting and installs in seconds. Based in Atlanta, Georgia, McGee Storage & Handling is a reputable, full-service subcontractor, providing new and used material handling products and solutions. With over 40 years of experience and more than 5,000 satisfied customers, McGee has a proven track record for providing cost-effective solutions tailored to solve your material handling and product storage challenges. It is important to understand that the dynamics in warehousing sector is different and the decision of setting up the warehouse at the right location is a make or break deal for any such investment. Safety is always top of the mind. To prevent collision and everything.